Learn how to compost in six easy steps. Surveys show that more than half of Tompkins County residents compost. Composting, which is the managed decomposition of organic matter, is very easy, and there are a number of ways to do it—both at home, even in apartments—and by taking food scraps to drop-off spots around the county. To compost at home, you need to build a healthy place for decomposing organisms to do their job! Composters feed a bin with nutritious food scraps and garden trimmings, known as “greens” (nitrogen rich food scraps) and “browns” (dry leaves, straw, newspaper, etc). After making sure that the compost has enough air and water, it can be harvested to enrich the soil in the composters’ garden or house plants. It can also be used as mulch! There’s a perfect bin for every household, not one perfect bin. You can build one out of wood pallets, wire mesh, or buy a plastic one at the Recycling Center, to name just a few options. The best place for a compost bin is where you will remember it! 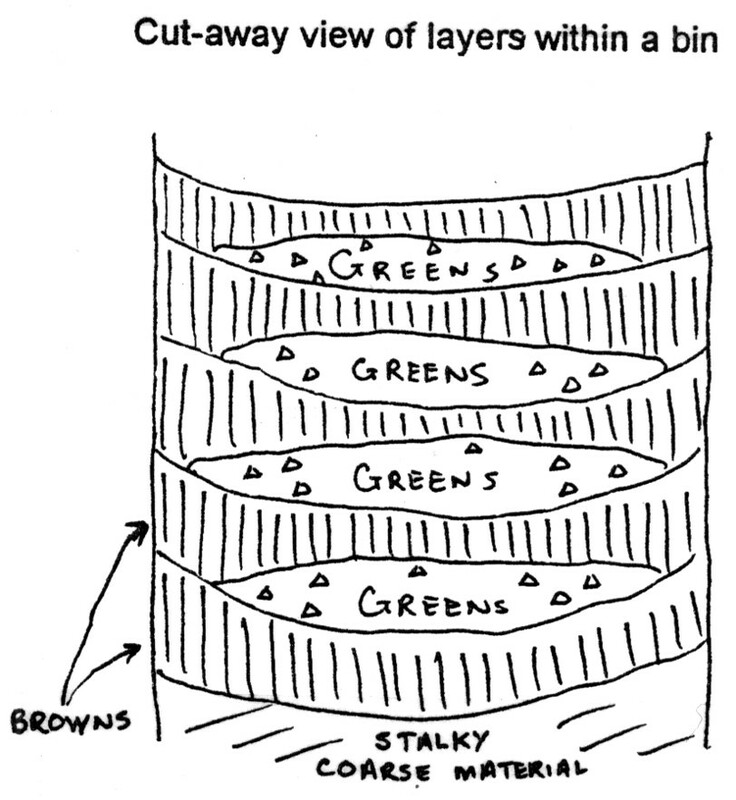 The primary reason compost gets slimy or is unsuccessful is a lack of browns, which are carbon-rich. Collect enough leaves in the fall (straw or shredded newspaper work, too) to layer 3 to 1 over all food scraps. The “Lasagna Method” is a way of structuring a compost system so that maintenance is minimized, pests are deterred, and both large and small amounts of compostables can be handled at any time. This simple layering system can be used in any bin. A) Start with a loose layer of twigs and branches at the base for aeration. This is so that air can reach the center of your pile, preventing unpleasant odors involved with decomposition. B) Next, add a bowl-shaped layer of browns. C) Add food scraps to the bowl. These are seen as the “green layers,” and are nitrogen-rich. Besides food scraps, you can use grass clippings, garden weeds, and manure! Do not use meat, oily materials, dairy products, or bones. These will attract pests to the compost area. D) Next, cover the scraps with 1”-2” of browns in a bowl shape. Repeat steps C-D.
What your bin should look like when lasagna layering. Image courtesy of the Compost Education Program at CCETC. Strictly optional! Turning does speed up the process, so you will have more finished compost faster. If you’re not concerned with speed, let it sit, and it will rot just fine without your attention as long as you use the lasagna layering technique. When the stuff at the bottom of the bin looks and smells like rich crumbly earth, not recognizable food, it’s time to use it in your garden or on your houseplants. You can also use it as mulch around trees and plants! There are also other options for composting outside of doing it in your home, such as vermiculture (composting with worms!) Throughout the county, there are also drop-off spots for your food scraps! Learn more here.